I openly admit that I am infatuated with Valentine’s Day. It’s my dad’s fault. Every February 14th, he left work early and made “his girls” an amazing four course, gourmet dinner. I fondly remember the carrots cut to look like hearts, chicken cordon bleu with red toothpicks, chocolate boxes filled with gold trimmed truffles, and all the sparkling grape juice I could guzzle. To some cynics, though, Valentine’s Day is “just another holiday made up by greeting card companies.” So, in defense of my not-so-secret obsession, I set out to find the true history behind February 14th and why it’s a day worth celebrating. There are at least three different saints named Valentine or Valentinus. One legend holds that Valentine was a priest during the third century in Rome when Emperor Claudius II outlawed marriage for men. Single men, he thought, made much better soldiers. Valentine believed this to be a huge injustice and so he continued performing marriages for young lovers. Claudius eventually found out about these secret marriages and ordered that the priest be put to death. A very romantic way to go. Valentine was certainly a heroic and romantic figure. As such, he became a popular saint in England and France, and a holiday was created in his name. 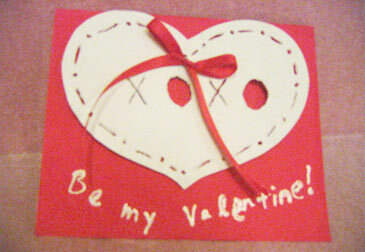 Some think the holiday is celebrated in February to commemorate St. Valentine’s birth or burial. Others argue that February, the official beginning of Spring (whether it feels like it or not), is considered a time of purification, and what’s purer than the recognition of love? The middle of February is also the beginning of birds’ mating season – enough said. Whether or not you plan to contribute to the 141 million valentines exchanged each year, embrace St. Valentine’s spirit by teaching your kids the importance of love. You don’t need to prepare an elaborate dinner, but planning something for the whole family to do together can show your little ones (and your big ones) that Valentine’s Day isn’t just for young lovebirds. It’s for families too.